Adopt this Cutie and You Can Have Breakfast with TIFFANY every morning! TIFFANY is ready for adoption. Meet TIFFANY at PetSmart Bellmore. Her tabby brother CHUCKIE is there too. 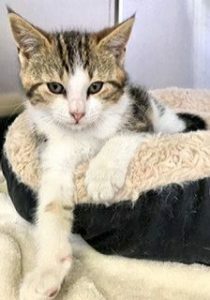 This entry was posted in Adopted, Adopted Cats, Cats, Female, Petsmart - Bellmore, Under 6 Months. Bookmark the permalink.